At EuroPython, on 2009-07-01, Tony Hoare gave a very interesting speech on the opposition between science and engineering (video here). In many ways it reprised the themes of Laura Creighton’s keynote from PyCon UK 2007, but from a science perspective rather than a history of science perspective. In the middle of the talk, some wit twittered “Stand back! Sir Tony Hoare is about to do science!”; shame it wasn’t on the big twitter wall. On the scales on the side of Science we have things like “long-term”, “perfection”, and “originality”. Balancing the scales for Engineering we have “short-term”, “adequacy”, and “best practice”. 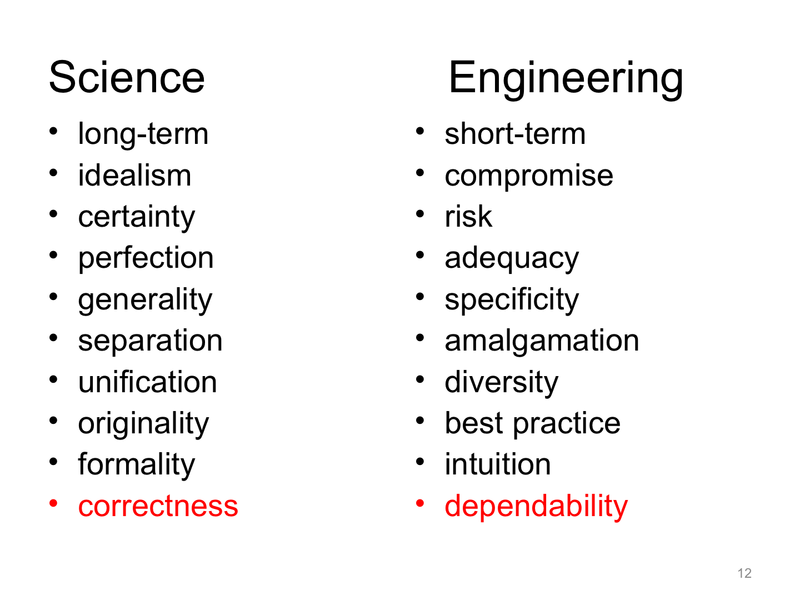 What I liked about this slide is that many of the things on the Science side would be seen as defects in an engineer, and many things on the Engineering side would be seen as defects in a scientist. We have all seen scientists attacked for relying on intuition or merely amalgamating best practice. And what engineer has not been barracked (by their manager) for attempting solutions that were too perfectionist or wasting time on long-term goals? Tony Hoare’s insights are clearly the product of long and hard work. He seems very optimistic about the possibilities of a virtuous feedback between the engineering and scientific sides of computing. Perhaps we have every right to look forward to the day when “Software will be the most reliable component of every product which contains it.” (the last slide from his talk). But right now… it seems a long way off. This entry was posted on	2009-07-04 at 20:52:23	and is filed under Uncategorized. I wonder what would happen if one tried including “Art” and “Logic” as well as “Science” and “Engineering”, though. In writing software, I find all four are in tension. Maybe the red headline interests would be “absoluteness” and “accessibility”? is that art as in “artificial” or art as in “creativity” ? Which seems to point to Science.Originality, or is that referring to lack of duplication? Definitely a tension, there — but more for the individual. And as to “Logic” — isn’t that a branch of mathematics, and thus falls under either Science.Formality, Science.Certainty or Engineering.Specificity ?